Just a few weeks after the closing of the epic show by artist Phlegm (The Bestiary), Howard Griffin Gallery in Shoreditch, London, has transformed in a gritty and raw space that in a way reflects the original work environment for Thierry Noir, whose works are shown at the gallery now. Thierry Noir: A Retrospective is his first ever solo show in his 30-year career. Noir is considered by many as the pioneer of the modern street art movement. Thierry Noir was born in Lyon, France in 1958 and in 1982, inspired by the music of the New Wave, moved to Berlin where he, as so many young people at the time, lived in a squat. The 80s in Berlin were grim because of the Wall that divided the city, not only geographically but also socially and emotionally. To me it is still a difficult concept to grasp: a western European capital in modern times being divided by a wall in an area heavily patrolled by police. I had obviously learned about this phenomenon at school but realised that one cannot fully understand how the Wall affected everyday life of the citizens of Berlin when I first visited the city and the remains of the Wall just a few years ago. Try to imagine living on one side of a city and suddenly not being able to see your friends or loved ones anymore or to able to freely move from one side of the city to the other. If you tried to climb over the wall, you would risk being arrested or even shot. Still many artists risked their lives and painted on it, out of protest of this emotionally grotesque landmark. From the building where Noir lived, a massive abandoned hospital, he would every day watch the border police patrol the so-called Death Strip on the border of East and West Berlin. After having lived in the shadow of the Wall for two years, he decided to start painting on it and thus to transform it and ridicule it. In 1984 Thierry Noir was the first artist to illegally paint miles on the Berlin Wall. 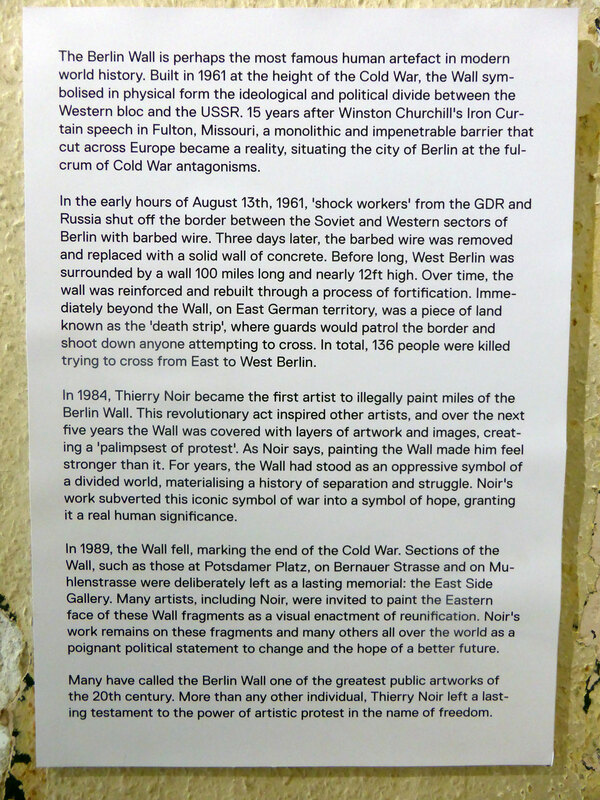 As it was built just 3 metres beyond the official border, Noir took the risk of arrested (or even shot) by the east German police who were able to arrest anyone for just standing near the Wall. For five years he painted every day and covered over 5 kilometres of the Wall with his bright and colourful murals. He learned to paint as fast as possible using only three colours of paint. Noir named his distinctive painting style the Fast Form Manifest. Two versions of ‘Elephant Key’, top one is the original work as on the Berlin Wall (one of his first wall paintings) and the bottom one is the updated work on display in the current gallery show. 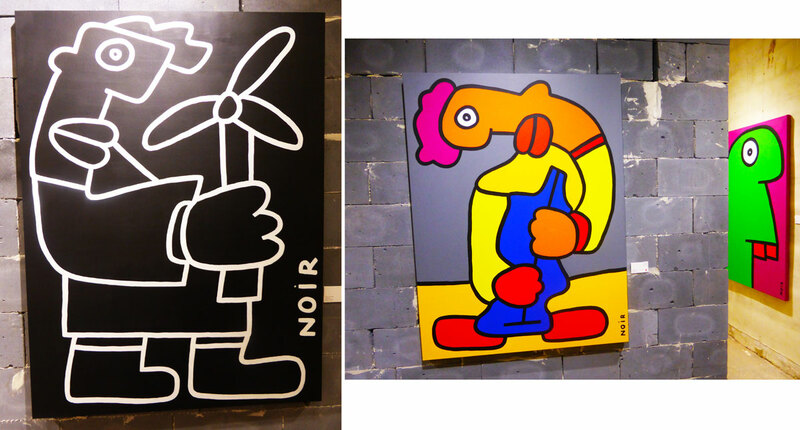 Noir’s works are inspired by artists as Pablo Picasso, Joan Miró and Claude Monet, but also street artists as Jean-Michel Basquiat and Keith Haring. Also television and comic book imagery influenced his works as well as music by artists as David Bowie, Kraftwerk, Led Zeppelin and Nina Hagen. On the left: Flower in the night. The unique retrospective at Howard Griffin Gallery not only displays new works, but also interviews and films and rarely seen photographs. TV installation showing old footage of Thierry Noir’s works and interviews with the artist. Rarely seen photographs of Thierry Noir’s work in Berlin. Visit Thierry Noir: A Retrospective at the Howard Griffin Gallery. The exhibition is on from 4 April till 5 May 2014. You can see bigger versions of most of the photos in this post on my Flickr page: Thierry Noir. Please read my review of the marvellous previous show at Howard Griffin Gallery: A Modern Bestiary by street artist Phlegm. *Unlike my other posts, I have made great use of the press release and gallery text for this article. Posted in culture, street art and tagged Berlin Wall, Cold War, graffiti, Howard Griffin Gallery, mural, retrospective, street art, Thierry Noir, urban art. Bookmark the permalink.